Improving your case handling and storage efficiencies. The LCF uses gentle but persistent vibration throughout the operation to settle the product. 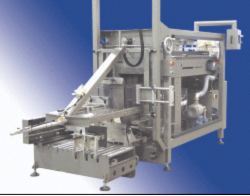 The automatic feed-triggered cycle positions the case, closes the end-flaps, and applies adjustable pressure to square the top and to compact the contents. Adjustment for different case sizes is extremely simple. For more compression and higher speed our two station case compactor is available. The Model LCF can be used with any closer. 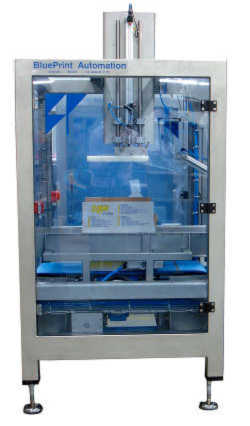 The Delta Robot packs almost any type of lay-down (horizontal) pattern directly in the case, tray or the flowwrapper chain; ideal for pillow bags, pouches and other free flowing, heavier packages. The vision scans the incoming products. This information of the exact position and orientation is send to the controls of the Delta Robot. The Delta Robot in its turn takes the products and places them into the case. With higher speeds the Delta Robot picks more products before placing them into a carton. 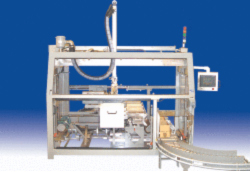 In this way the Delta Robot can also load a tray or a flowwrapper chain. The Delta Robot is driven by servomotors and controlled by a state-of-the-art motion controller. Designed to offer you flexibility and diversity! The vision scans the incoming products. This information of the exact position and oriëntation is send to the controls of the Delta Robot. The Delta Robot in its turn takes the products and places them into the case. With higher speeds the Delta Robot picks more products before placing them into a carton. In this way the Delta Robot can also load a tray or a flowwrapper chain. Case packs almost any type of lay-down (horizontal) pattern; ideal for frozen vegetables, granular products and other free flowing, heavier packages. Bags are conveyed onto the patented “bomb-bay” belts, which index to collate the proper number of bags into a row. When a full row is accumulated, the “bomb-bay” belts swing open and the bags are gently and accurately loaded into a loading cassette. The cassette opens and places the bags into the case. 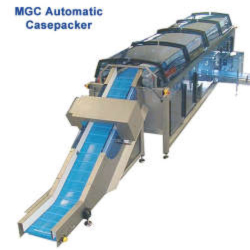 The MGC is fully programmable for all popular horizontal pack patterns including both lengthwise and crosswise orientation in one, two or three rows per layer. This gentle gravity packer operates at speeds up to 180 bags per minute. 100% automatic changeover, product conditioning, positive bag turning at all speeds, motorized conveyor adjustment for drop height, case vibration and integrated case erector. Product Ideal for frozen vegetables, granular products, fresh produce, IQF chicken, as well as a wide variety of other free flowing, heavier products. Unscrambles and feeds flexible packed product coming from bulk storage at high speeds. Product in bulk is fed manually or automatically into the bulk hopper of the feeder, where they are released on demand towards multiple servo-driven tracking sections. Here the product is first separated, brought into a single line, than, if necessary, turned into one direction (short side leading) and spaced evenly. From here the products can be fed directly into the packaging cell. 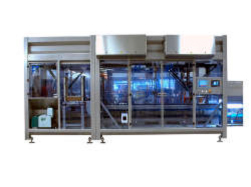 The Rainbow Feeder is ideal for bulk feeding of product to a BluePrint Automation vision-guided robotic system, creating a single lane of product for another packaging process or merging of different flavored bags to a production line to create a multi-pack. Highly Accurate: Unsurpassed in build and flexibility! 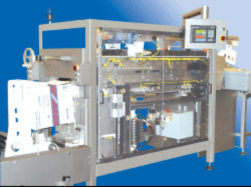 Horizontal case packer packs a variety of packaged products directly into cases, trays, crates, and other secondary containers; ideal for bags, pouches, flow-wraps, thermo-formed containers and a variety of rigid containers such as cartons. Product is collated into a group using one of our custom collation methods. The product is then picked by a specially designed end-effector and gently placed in the secondary container. The robot is fully servo driven and controlled by a state-of-the-art coordinated motion control package. Smooth parabolic paths eliminate sudden acceleration and vibration. Designed to offer you flexibility and versatility! The VP case packs vertically into secondary container; ideal for fragile products such as bags of chips and other snacks. Now supplied with optional automatic changeover (virtually no manual adjustments)! Simply select your product code and the end-efffector and cassette automatically change over to your next bag and case size. It’s that simple! Product is collated into a group using our Smart-Trak collation system. The product is then picked by one of our specially designed end-effectors. 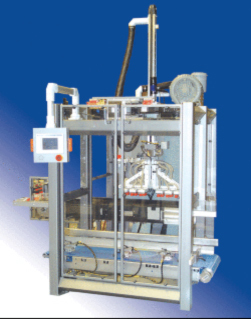 The fully servo-driven robot ensures smooth placement of the product into an intermediary cassette. Cases are tipped towards the cassette and the entire stack is side-loaded into the secondary container for a stand up (vertical) presentation. The Robotic Vertical Packer, with its smaller footprint and patented high-speed collation method, is available with integrated or reusable case erection and closing for new or re-usable cases. Automatic Changeover (Optional): Providing our customers with a solution that bounces back to maximum efficiency after the changeover process is complete. Gravity case packs a wide variety of rugged products directly into the secondary container; ideal for bags of fresh or frozen vegetables, IQF chicken/beef and a wide variety of other flexible packages. Product enters the rotary packer on a conveyer belt. For slow speeds and single bag drops, product transfers directly to the rotary gates. For higher speeds with multiple bags per drop, an indexing gate forms groups of product, which enter the rotary gates as a single group. The gates then rotate at high speed, dropping the row/layer of product directly into the case. The RP is available for full high pressure, caustic wash-down environments! Eliminates Human Error: With automatic changeover, human error is eliminated when changing over between different product/case sizes; No manual adjustments! Small and Compact: A footprint that works with virtually any layout. 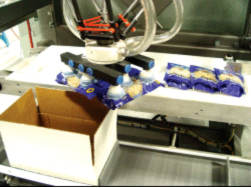 Versatile robotic cell packs bags and other packages laying down (horizontal) and standing up (vertical) into cases, crates and other secondary containers; Ideal for bags, pouches, cartons and other flexible and rigid packages. Product is collated into a group using one of our custom collation methods. The product is then picked by a specially designed end-effector and gently placed in secondary container. The fully servo-driven robot ensures smooth placement into the secondary container. Begins with collation and the picking of the product just as the horizontal configuration. Instead of loading directly into the secondary container, the product is placed flat into an intermediary cassette. Cases are tipped towards the cassette and the entire stack is side-loaded into the secondary container. Fast and tool-less changeover between horizontal and vertical patterns! The Swing Machine gives you incredible versatility and peace of mind. Case packs flexible bags standing up (vertical) and lying down (horizontal) on the same machine. Ideal for packing bags of frozen potato products such as retail and service food bags of french fries and other heavier frozen and fragile products. Each bag is positioned into a side-loading cassette by means of a patented servo transfer plate. The servo plate comes out from under the in-feed conveyor and gently carries the bag forward at a very low speed. Once the bag is on the plate, the plate retracts at high speed allowing the bag to position itself in the cassette. A full cassette load is side loaded into a 90° tipped case. During flat (horizontal) packing, a flat-pack-cassette is simply lowered in front of the loading mandrel. Once positioned, a pre-stacked caseload can be gently top loaded. The VHPF can help those who want to reduce case sizes! By pre-compressing a caseload, bags can be slipped into cases that are smaller than previously required. 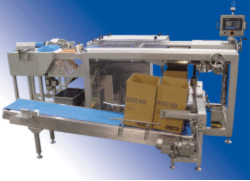 Case packer for high-speed vertical packing of flexible bags; Ideal for bags of frozen foods such as potato products and other heavier frozen and fragile products. Bags are settled with out specially designed square roller. Each bag is then positioned into a side-loading cassette by means of a patented servo transfer plate. The servo plate comes out from under the in-feed conveyor and gently carries the bag forward at a very low speed. Once the bag is on the plate, the plate retracts at lightening fast speed after which, the bag positions itself in the cassette. A full load is side loaded into a 90° tipped case. The VP/F III packs bags ranging from 1 to 10 lbs. standing on either long or short edge. Blueprint provide and service truly flexible packaging systems that can meet tomorrow’s increasing demand for frequent size changes and packing configurations.